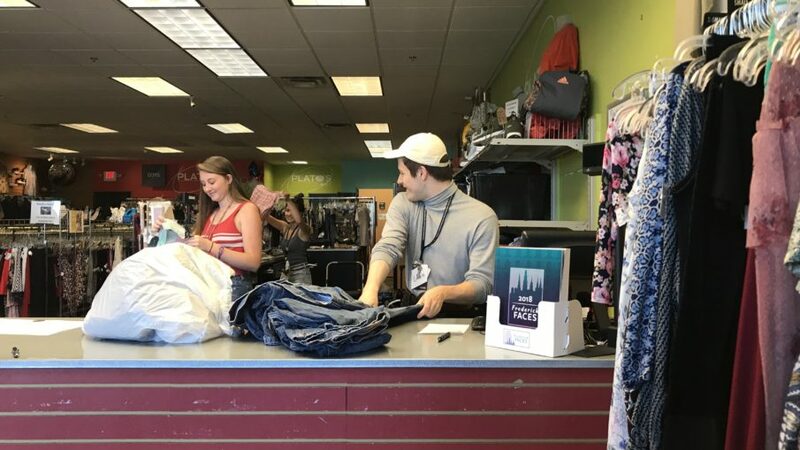 Plato's Closet employees sort through clothing and choose what to accept to sell. Abigail Brooke/The Commuter. Poshmark is a virtual resale store that is changing the thrifting game. Poshmark and other stores like it, such as Depop have risen to popularity in recent years, especially among teenagers and young adults. The sites allows users to buy and sell clothing by hosting their own online boutique. Sellers can advertise and price their products as if they are their own retailers, and buyers are able to sift through products using price, size, and other kinds of filters. The statistics prove Wilson’s point. According to Poshmark’s 2013 report, over 1.5 million items had been sold at the time. Users, or as they’re called, “Poshers,” use the site to both make a profit and clear out their unwanted items. Selling items on Poshmark is popular not just for storage purposes, but some also use the site to start their own businesses. Sunny and Curated, an online boutique started by FCC graduate Courtney Cairns is a resale store that operates entirely on Poshmark and Instagram. Sunny and Curated is focused on selling name-brand and vintage clothing at low prices. On the store’s Instagram page, Cairns says “I love a deal, I love getting people a deal.” Her ultimate goal is to be a local pop-up shop, but for now, social media and resale apps are the backbones of her business. Other Poshmark shop-owners use the site as a main source of income among other jobs and enjoy the flexibility of being small business owners. However, affordability is not all that draws consumers to resale. Stephanie Smith, owner of Plato’s Closet for the past two years says that she feels the resale business cater to a more conscious generation. Individuality can also drive buyers to resale stores or apps. While some may see these resale apps as a passing fad, their supporters think otherwise.